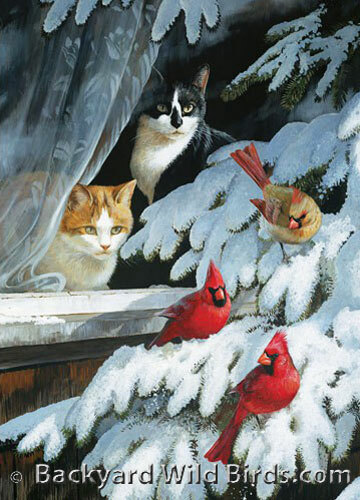 Cardinals In Pine Tree Puzzle is a 1000 piece puzzle. This Fire in the snow puzzle has 3 Cardinals in a wintery scene. 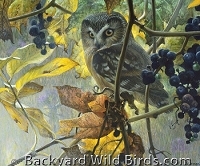 This beautiful and peaceful setting is very eye catching and is a joy to gaze at its finished picture. Do 'Birds of a Feather' really flock together? Maybe the female is trying to choose which male gets her attention. Which Northern Cardinal do you think she will select or are they a family with one male her offspring? The bright feathers of these three cardinals have drawn some most unwelcome attention. 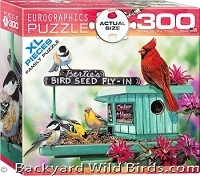 Attractive wild bird puzzles in thier natual setting are great fun to put together with kids. Made in the with the finest inks, premium grade board, and the most endearing images. Finished size is 26.6" x 19.25".